The leg tower is designed with the implementation of a heavy base plate with knee struts utilized when necessary. The vertical supports are manufactured of angle iron of varies sizes and thickness determined by application. 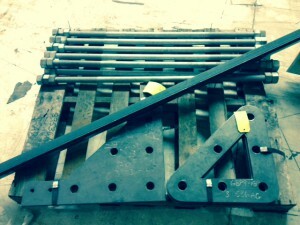 All uprights are punched to accommodate the angle iron cross bracing. We have determined the angle iron to angle iron design to be superior as it is entirely bolted thus eliminating the need for welding. The advantage of this design is that angle iron does not trap water, this trapped water can allow for structural damage due to freezing in winter weather conditions. This tower is designed for 90 or 120 MPH winds. Additional designs available upon request. Stairs are manufactured using grip strut treads. They are available in custom widths if required. Tower Stair cases are available in Wrap Around and Switch Back styles. 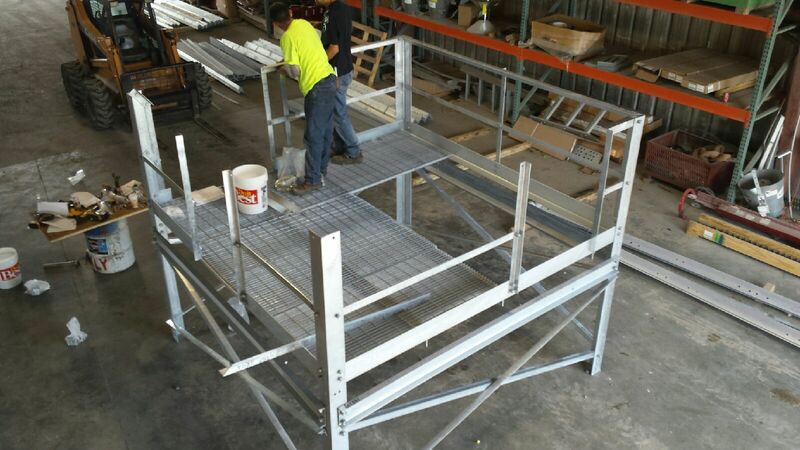 Custom Landing Platforms and walkways for clearance are available. 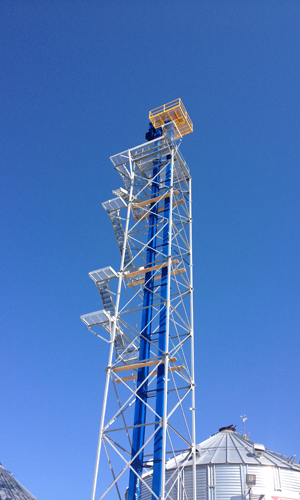 Tower Platforms are available in full or partial floor, Platforms frames are manufactured of angle iron with Grading for flooring. This is used to provide a more stable working surface with fewer required cross members. Towers include a Tower Template to assist in installation of the tower. The template consists of anchor bolts and a frame it ensure proper location of the base plates of the Tower. This assists in the Installation of the tower and foundation. Foundation drawings are provided for each tower ordered at no additional cost.